From the 1950s through the 1970s, most Americans found a job, then stuck with it for 30 or 40 years. When they retired, they received a pension, and it provided them with a guaranteed income for life. However, in the late 1970s, the 401(k) replaced pensions – and changed that forever. Now, many of us constantly change jobs, and can amass multiple 401(k) accounts in the process. They can be scattered across different employers and custodians, and they can have different investment strategies and fees attached to them. Making sense of where they are – and what to do with them – can be more than a little confusing. On our first podcast of 2019, we dig into the many options you have if you have a number of 401(k) accounts and the advantages and disadvantages of each, as well as the worst case scenario option that you should almost never even consider. How switching from pension plans to 401(k)s shifted risks in retirement from employers to employees – and why this shift fundamentally changed American employment. Why some of our clients amass 5 or more 401(k) accounts over the course of their working lives – and the reason it’s so easy to lose track of them. Why you may want to leave money in a 401(k), even if you’re no longer with that employer. The factors you should consider before rolling money out of a 401(k). How to efficiently consolidate your 401(k) accounts. Why cashing out a 401(k) is one of the worst financial decisions you can make – and it should be considered an option only if you absolutely need to do it. If you enjoyed this podcast, be sure to rate and review, and send us all your questions at questions@bayntree.com – it may become the topic of an upcoming episode! [00:00:45] Andrew: Happy 2019, listeners. This is your host, Andrew Rafal, and after a brief hiatus we are back better than ever for our Season 2 of Your Wealth & Beyond Podcast. We’ve got awesome stuff lined up for you later this year, notwithstanding today’s episode, which is going to deal with all things 401(k) especially and more specifically what your options are when you switch jobs. So, many of us out there we are switching jobs, switching careers. It’s not like the 50s, 60s, and 70s where you stay with your employer for 30, 40 years. Why most people stay back then? The pension. The employers used to take on the risk and an employee would work and be loyal and then they retire and, boom, they would get a guaranteed income from the pension. Well, guess what? In late 70s, early 80s, the advent of the 401(k) and employers realize, “We could take the risk off of us and put it on our employees,” hence the 401(k) and how they became very prevalent in the 80s, 90s, and obviously now in the 2000s. Now, the risk is on you, the employee, and it is one of still the greatest vehicles out there to save for retirement, but most people are not staying at their jobs as long as they did back in the 50s, 60s, and 70s. So, now we’ve got to talk about what the options are when you switch jobs with that 401(k). We come across it all the time. A lot of times clients will come in or a new client, and they may have five or six old 401(k)s that are one sitting at Fidelity, one at Schwab, one they don’t even know where it is. And of course, with all these different accounts, they don’t know the investment strategies, the fees. So, we had to dig in today and go through what your options are. [00:02:41] Andrew: We’re both going to talk about what the reasons are to leave money in your plan. There are some reasons to do that, even when you’re no longer with the employer, and reasons on why to roll over those funds and going through the various options. So, a couple of things we want to look at. For those of you that are a little bit closer to retirement, if you separate from service and you’re over 55 but you’re under 59 ½, one reason that we want to keep the 401(k) or you may want to keep the 401(k) at the employer is because there’s a special exception where you can take penalty-free distributions from your 401(k) before 59 ½ if you’re over the age of 55. If that was rolled to an IRA account, you will have the 10% penalty. So, if you’re close to 59 ½ and you separate from service and maybe you don’t have income coming in and maybe got terminated, definitely a reason to keep your 401(k) where it is. And here’s a little tip, if you’re planning on maybe leaving that job and you have an IRA before you leave your job if the 401(k) plan allows you to transfer IRA money into the plan, that might be a great option. Move the IRA into the plan and now you can withdraw funds without the 10% penalty. 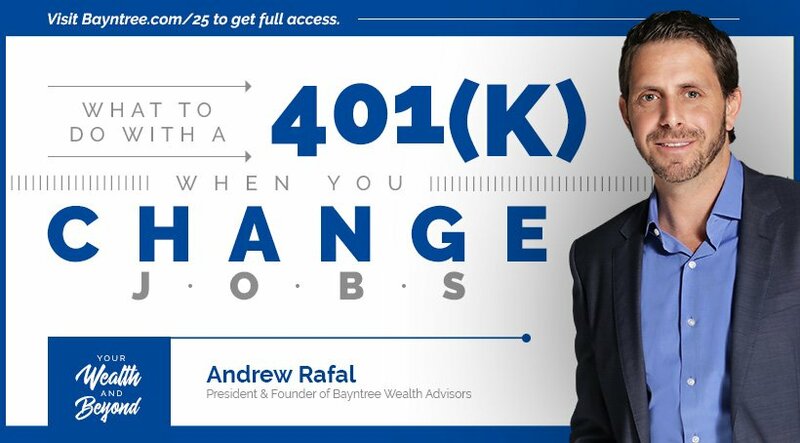 Here’s the thing though, we as investment advisors and financial planners, we don’t recommend taking money out of a 401(k) or an IRA at 55 but if circumstances are needed, this is an option of why you would want to keep your 401(k) there. Okay. So, that’s one. Here’s another option of why you want to keep your 401(k) rather than roll it out. So, when you turn 59 ½, most 401(k) plans allow you to do what’s called an in-service rollover. [00:04:47] Andrew: So, a lot of people take advantage of it meaning at 59 ½ they can roll funds out of the 401(k) and into an IRA. This is a nontaxable event. Reasons people do it? Better strategies, maybe lower fees, more active management. There’s a whole gamut of why you would want to do that but we know with IRA accounts from our previous podcasts that at 70 ½, you are required to withdraw funds from your retirement accounts. This is an IRA, a 401(k) if you’re not working at the company, a SEP IRA, a 403(b), etcetera. That amount is just under 4% the first year and then it goes up in each and every year. So, here’s a little exception though. If you are still working in over 70 ½ and have a company plan 401(k), you do not need to pull out your required minimum distribution. Now, you must be a full-time employee and there are also some exceptions. If you’re the owner of the company or own more than 5% of the company, then that rule doesn’t weigh down and roll over to you. But for the majority of us out there, you do not need to take your RMDs from that 401(k). So, here’s where some planning can come into play. If you’re aware of this rule, you do not want to most likely move money out of a 401(k) into an IRA if you don’t need the income. Also, if you have an IRA, you may be able to roll that IRA into the 401(k) and not have to take out the required minimum distribution. One caveat, if you separate from work any time during the year when you’re over 70 ½ and I mean if you’re separated on December 31, you will be required to take out the mandatory distribution. [00:06:45] Andrew: Now, in earlier podcasts, we did a whole show on required minimum distribution so getting into much more detail there, but that is one reason why you maybe want to keep the 401(k). Another reason and again we don’t really recommend taking loans on the 401(k) but if you had taken a loan out and it’s outstanding within your 401(k) plan, before you roll that over, you have to pay off that loan and/or if you roll over the 401(k), the loan, then you haven’t paid it off, the loan itself will be taxable and you’ll have the 10% penalty if you’re under 59 ½. So, that may be a reason depending upon your situation, everyone’s different, but it may make sense to keep that 401(k) where it is or roll that over to the new company plan. I will get into the reasons on that but ultimately, you got to be careful when you have loans. IRA should not allow to have loans against it. We get the question time and time again; can I take a loan against my IRA? You cannot. So, that is something that you really want to consider before just rolling monies out. Now, one of the reasons when we look at 401(k) plans is that you may have a really good plan. Another reason may be to keep the funds there because you got some low-cost options, you potentially may be able to manage it some of yourself. So, these are all things that you want to take into account but the challenge becomes when you’ve got four or five 401(k)s, maybe one is 10,000, one is 60,000, one is 30,000. There are different custodians. They’re from different employers. It’s really hard to get a handle on what you have, what kind of fees you’re paying, what kind of asset allocation you have. So, one area where it makes sense to consolidate is when you do have a lot of outside accounts from different places. [00:08:41] Andrew: So, let’s now get into what your options are when you change jobs with regards to your 401(k). So, we’ve talked just earlier about why you would want to keep your money at your current 401(k) plan. So, the advantage there you’re familiar with the plan, you can go back to some of the things we just talked about. It’s easy. You don’t have to do anything. Disadvantage is once you’re no longer an employee, trying to get money out of 401(k)s become quite difficult. A lot of times it’s paperwork or however the plan is set up, and you may be charged additional fees because you’re no longer an employee. So, many factors in that realm. And again, if you got outside accounts, how are you going to keep track of everything? So, option one, though, is leave it where it is. Option two is where you can roll that 401(k) into your new employer 401(k) plan. So, this is where you could consolidate your other 401(k)s that are lying dormant in other places and consolidate that so that you have a better handle of things. Now, the key component though is you got to really understand what is inside the plan, how much control that you do have with regards to the choices and just fully understand what the plan rules are. Disadvantages versus an IRA and moving it out to an account that you manage is that you always are going to have much more options in the IRA realm. So, that’s a disadvantage of moving that money in but for some people, it’s just they want to keep it easy and rolling it from one of the other. Also, if you have a loan on your 401(k), if you have a loan, you may be able to transfer the 401(k) over to the new plan with the loan continued so you don’t have to pay the tax and the penalty on that. So, that’s just something to keep in mind back to that loan. If you got questions, you can reach out to us. Go to our website, Bayntree.com, you can talk to an advisor, you can also email us at info@bayntree.com. Just ask us a question. We can go into some more details on your specific situation. [00:10:48] Andrew: So, now the third option, which many people take advantage of, is transferring or in this case, rolling over the 401(k) to an individual retirement account, an IRA. Why we would do this? Well, first and foremost, you have an unlimited amount of investment choices instead of the small amount in many that’s available inside the 401(k). Total freedom, you can create many different IRA accounts. It doesn’t have to go into one investment strategy. Many times, we have several different accounts set up, one more risk, one that’s more moderate, and one that maybe has some protection or some safety. So, that’s an important component, plus you can control the fees. If you’re a do-it-yourselfer, you could go to any number of custodians, whether it be TD Ameritrade, Vanguard, Fidelity, and buy some low-cost ETFs. A lot of them now don’t have any commissions on them. They’re very low expense ratios and you can just control your asset allocation there. Also, a greater freedom to name beneficiaries. This is an important thing. The beneficiary of your 401(k) by law must be your spouse unless you have to obtain a release from him or her. With an IRA you have a lot more control of who you nominate or dictate as your primary and contingent beneficiaries. Also, when you do, or I mean, I guess not if, when you pass away, it’s a little bit easier for the beneficiaries that are a non-spouse to create what’s called an inherited IRA. These are items we went into great detail in previous episodes that you can find on the Your Wealth & Beyond Podcast, but a little bit more freedom in that realm. Some disadvantages, well, you got to be careful in transferring the money over. I would always recommend talking to an advisor to help you through it. You have to do a rollover. [00:12:41] Andrew: Now, many times when you do initiate a rollover, the current company is going to send you a check. But don’t worry, that check is going to be payable to the new custodian. So, for instance, it might say, “Paid to the order of TD Ameritrade for the benefit of John Doe,” you will get that check and then turn around and give it to the custodian or you’ll give it to your advisor. That will be constituted as a tax-free rollover, a trustee-to-trustee transfer so nothing will be reported as income. If you take the money out from a 401(k) and take what’s called a distribution, most plans are going to withhold 20% taxes and, ultimately, there is a special rule that allows you to do one indirect rollover per year where you have 60 days to take that money and roll it over to an IRA. But you’ve already now had to worry about the 20% taxes that were withheld so it becomes very convoluted, very complex. We don’t recommend it at all. So, just set up the IRA first, contact the custodian. They will ask you if you’ve seen the special tax notice which you’ll have to read through and then they will cut you that check. Most companies you’ll get it within 7 to 10 days, so it’s a pretty seamless process. We’re seeing more and more companies that are allowing you to do it online as well and then they will either send the check to you or transfer the money or wire the money to the new custodian. So, that’s option three and in many cases it’s one of the better options just for consolidation, for control, for options, and ultimately in the future, also some more flexibility when you need to take out required minimum distributions, some more flexibility if you’re going to do some Roth conversions as well as more flexibility for your beneficiaries when you pass away. So, that was option three. Take your money, consolidate it, roll it over to an IRA. [00:14:45] Andrew: Option number four, I didn’t even really want to tell you that this option is there, but of course we know it is there. It’s cash out your account. Now, if you do this, you really have to think of the circumstances of why you’re doing it, and the ramifications. One of the advantages, obviously, if you need the money, that’s money that you are in a sense saving. It was for savings, 401(k)s are a great way to put money away without even thinking about it, but if you had an emergency, if you had bills to pay, if inevitably there is a house you wanted to buy if you’re starting a business and you need that money, it may be more advantageous to pay the taxes and the penalties. Now, remember, you will pay taxes on any distribution from your 401(k) pretax. That means it’s going to slow down whatever your income level is, whatever your income bracket is on the tax side, you’re going to pay that additionally, you’re going to 10% penalty if you’re under 59 ½. So, it’s a complete destruction, complete mass destruction of your overall retirement plan if you do that. If you have to, it’s there. You just have to understand what it’s going to do and prioritizing. Potentially, it may make more sense to take money out of a home equity line of credit if we’re only going to pay 6% interest versus giving up 30% between taxes and penalties. Obviously, you can do the math there where it makes sense to only look at your 401(k) as an ATM if it’s the worst case scenario and you have no other outlets. Even sometimes credit cards, maybe you can get a one year interest only, and then pay it off. So, just be very, very careful. 401(k) is for retirement. Retirement is exactly as it’s called. It’s going to be there for you so you have a paycheck when you retire. Retirement is all about income and if you cash out your account, you’re only going to be relying on Social Security which isn’t going to probably cover the bills so be careful when you cash out that account. [00:16:48] Andrew: So, to summarize, we’ve got four main high-level options. Obviously, there’s more details for each and every one of you of how this would work, but you can keep your money in your former plan. The positive there, it’s easy. The negative is it’s hard to track, less control. Number two, you can roll over the 401(k) your old one to the new one. That one allows you to consolidate, it allows you to roll over older 401(k)s as well, and we talked about why earlier in the show it makes sense to potentially keep the 401(k). Option three, the most flexible, roll over the 401(k) to an IRA gives you the freedom to make unlimited investment choices. You can have it actively managed by yourself. You can work with an advisory firm. You can do a combination of that. You could put it in something as safe as a CD or something as safe and simple as a fixed annuity that’s going to give you a certain rate of return for a period of time, many different options. Maybe you can create income from it. So, you want to look at how and why the investment strategy that you’re going to outline before you go ahead and do it. Now, again, you don’t have to have that strategy ready to go. You just have to have the IRA account ready and open before you roll over the 401(k) and also you can look at rolling over your old 401(k) so we don’t, you know, that’s important. You may have a $4,000 401(k). We don’t want to forget about it and you may get a statement once a year on that and what if you move and they don’t get an update on that? You may completely forget about that old 401(k). So, consolidation, freedom, controlling your investment strategy, controlling the expenses, and just to have a grasp of everything of the money that you’ve been saving. And the last option, the worst option, cash out the account. Pay the taxes, put your head in the sand, and I guess you’re going to have a hope and a prayer that your retirement is going to be there for you. [00:18:46] Andrew: So, really think long and hard before you cash out your account and really turn over any of the rocks, any other options, that you can utilize even maybe hard money loan. If you’re really that hard up for the money, see if there’s something else that will allow you to save. It’s never fun paying Uncle Sam 25%, 30%, 35% sometimes 40% in taxes and penalties. If you have questions, shoot us an email. We’re here for you. If you want us to go through your specific situation, just send us an email, give us a call, and if you do want a copy of my book, Climbing the Retirement Mountain: And Getting Safely Down the Other Side, you can shoot us an email and we’ll get that out to you. So, hopefully, this episode on 401(k)s, your options on why you would want to keep the 401(k), and the reasons you would want to roll over to an IRA. Hope this was helpful. 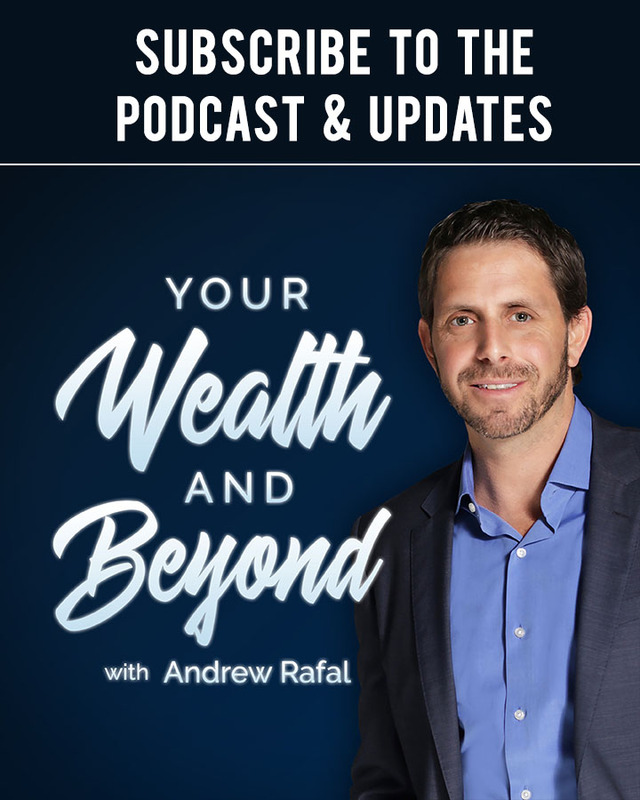 We’re here for you every step of the way and we’ll be back later this month with some additional episodes of the Your Wealth & Beyond Podcast. We are here to help you dream and we will plan. Happy planning, everybody.